My Hero Academia Chapter 204 was a bit about Tenya Iida & his past & now he has just 10 minutes left to utilize his full power and eliminate Class 1B. He has already put Spiral into the prison & his next target will be Juzo Honenuki. 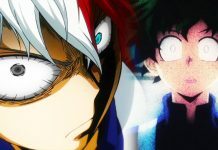 It is clear that the next chapter will be stretching the same battle, but this time it’s about Todoroki v/s Tetsutetsu. By the end of the previous chapter, we saw an opening of his new power, which will be shown in My Hero Academia Chapter 205. Confirmed spoiler for this chapter is yet to be revealed, but there are few things that we would like to discuss in this Article. What is Todoroki’s New Power? During the battle between Todoroki & Tetsutetsu, we saw a glimpse of his past where his father talks about releasing the heat of his body to its very limit. This clearly indicates that he has something left to show. Also considering the fact about Tetsutetsu’s training in Hearthi, where he had trained himself to consume the heat at its extremist, which also make it as a challenge for Todoroki. This is the first time that we are seeing Todoroki going through such extreme state. It is really hard to say who will win in this match, but it is obvious that the fight will be getting interesting. In this chapter, we will be seeing Todoroki overcoming his limit & showing his wildcard to everyone. It will also be shocking to Tetsutetsu to know Todoroki power crossing Hearthi’s. If you still want to know more about this chapter’s spoiler, you can check us back in a few days. We will update you about this chapter & if you have something else to discuss, feel free to do it in the comment below. 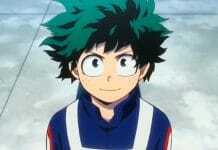 The release date of My Hero Academia Chapter 205 is confirmed and it will be out on 9th November 2018. But, if there is any change in the schedule we will update you here. My Hero Academia Chapter 205 will release on 9th October & in this chapter, we will see Todoroiki's new power.